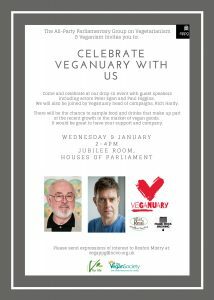 The All-Party Parliamentary Group on Vegetarianism and Veganism provides a forum for discussing issues around vegetarianism and veganism. NCVO is delighted to provide the secretariat for this group. The group is funded by the Vegan Society and Vegetarian for Life. 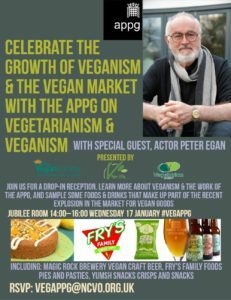 We very much welcome attendees with an interest in vegetarianism, veganism, or special diets; public health; the environment; and animal welfare. Meetings will usually take the form of presentations by speakers and then a Q&A with the floor. However, parliamentarians do have priority in asking questions. We hope that meetings will be attended by a range of parliamentarians and stakeholders. Potential topics for discussion include food and medicine labelling, vegetarianism and veganism as protected beliefs, impact of diet on climate change, and institutional catering provisions. This is not an official website of the House of Commons or the House of Lords. It has not been approved by either House or its committees. All-Party Parliamentary Groups are informal groups of Members of both Houses with a common interest in particular issues. The views expressed in these webpages are those of the group. Public procurement: do public authorities have a duty to supply vegan food? Is it time for a legal definition of veganism? Norman Dinsdale: how can caterers improve the services that they offer in care homes? What does Brexit mean for vegetarians and vegans? ©2019 All-Party Parliamentary Group on Vegetarianism and Veganism. All rights reserved.